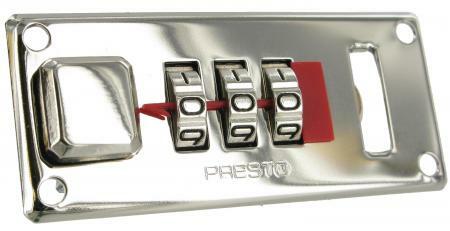 Presto Nickel 3 Dial Combination Lock. This replacement Presto three dial combination lock suits many briefcases. It is available in shiny nickel only. Please select left or right hand lock from the pull down menu. This small Presto nickel briefcase hasp is an appropriate replacement catch for many briefcase combination/ key locks. Do however check dimensions and detail closely, as slight differences in design may mean certain spares won't work with your briefcase. Dimensions: Length (closed) 45mm Width 32mm Hole centres 22mm. Suits either left or right hand locks. This range of replacement parts is useful for practically minded people, who have a broken briefcase they do not want to part with and who do not have a saddler or luggage repairer in their neighbourhood.